Has an ok creamy texture. My lips are dry again within 5 minutes after I have applied this balm. This lip balm is infused with shea butter, rose hip, pomegranate and vitamin E..so far, so good right? It sounds like all the right ingredients are in it to make your lips soft and desirable..except this lip balm really didn‘t live up to anything. Within 5 minutes after application of this balm my lips are cracked and dry again. Seriously it is as if I haven‘t applied anything at all to them. The texture of the balm is OK: a bit too oily for my taste, and soo stale you have to apply the balm with your fingers, even though the package is a tube. The balm needs to be re-applied quit often and gives your lips a vague shine. Basically this was a big disappointment and I want my money back! Cheap and great for all dry areas on your body. Mostly available at swedish pharmacies. It costs about 3 dollars there, so please do not buy this at french Colette for 10!! Tired of my local pharmacies, I headed over to Sweden for some serious shopping. Here I found a long lost friend (and a favourite of my beauty guru grandmother) the Försvarets hudsalva, roughly translated into skin ointment of the army. So what is it then? It’s a soft stick made of tallow and peanut oil, first manufactured by request from the swedish army, wanting a remedy against blisters for their soldiers. Today its a swedish classic, having its own wikipedia page. I consider it a great budget alternative (it costs around 3 dollars and lasts for months) to lip balm, which can come in handy when you have rough skin patches and also when out in cold temperatures for a long time. It works good for me and I see a result when applying it to the rest of my skin. The balm is light, organic and makes your lips soft, without being sticky. You need to re-apply often. 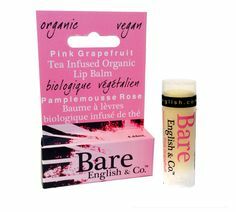 Bare English & co makes organic vegan lip balms, I found mine in Canada. The balm is light, organic and makes your lips soft, without being sticky. It brings together the best: oils for your lips in one small package. The mix of coconut oil, sweet almond oil, olive oil and others (I could go on and on and on) blend together in a moisturising mix with the light flavour of pink grapefruit. The best thing is all the ingredients are good for you: your kisses are now petroleum free. Unfortunately all this natural goodness is not very long lasting and re-applications after licking your lips or long make-out sessions is necessary. Also good for emergency cuticle moisturising. March 17, 2015 August 30, 2017 | Anna M.
I have said it before, and I will say it again: I’m a fan of Rudolph Care. I love that they make products without harmful ingredients or chemicals. I think this is something that the entire beauty industry should focus a lot more on: We apply these products to our biggest absorbing organ (our skin) several times a day. I.e. when using products with perfume, chemicals and what-have-you, we feed our body with toxics, and the consequences is starting to show around the world. Okay, enough of me preaching (I just wish there were more ‘healthy’ products). The Lip Balm comes in a little glass container and looks really cute. You have to stick your finger in the container and apply the balm with your finger, which I’m not a huge fan of, as it’s inevitable to drag some bacteria into my lovely lip balm. The balm smells great (the Rudolph smell) and it even tastes all right if you accidentally eat it, which is hard to avoid, when applied to lips several times a day. I keep the lip balm in my coat pocket or purse, to have it with me at all times. It works wonders on cracked winter lips, and during the summer time, it’s good for sunburned skin or lips. I also use the lip balm to give my lips a little “shine” when I go out. Even though I feel a here-and-now hydration and improvement of my lips’ condition, the balm does not hydrate my lips in-depth, further, this is an expensive product (around €26 for 15ml), but it lasts long. The container lasts for ages. Makes your lips yellow when you apply to much and doesn’t really make my lips soft for longer periods of time. When you are a Body Shop addict you overconsume, this is my case I admit it. And you become reckless investing in products that aren’t necessary so good. This is the case of the lip butter for me and most of my girlfriends (I did a quick ask-around at our latest get-together). You want it to be just as good as the body butter, but it just doesn’t live up to the hight standards set by the it and by the price. This lip butter smells great, it doesn’t really taste of anything but a bit of sweetness. It turns your lips yellow when you apply too much and it doesn’t really help dry and cracked lips. In fact Ive actually experienced that at times it made them even more dry. But hey, at least a package lasts for long. One last thing, I don’t want to sound old, but sticking your fingers into the same small container is just unhygienic.